Hello everyone! It’s been a while. I took a break to travel to Europe! I went to Amsterdam, Brussels, Bruges, Lausanne, Luzern, Bern and Zurich. It was incredible! After coming back, I took my aunt (my father’s sister) who’s visiting from Korea to NYC and Niagara Falls. 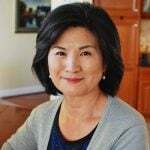 She’s 79 years old, and this is her first time traveling outside Korea. It’s been so much fun taking her around! 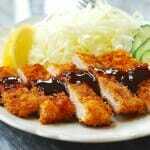 Tonkatsu is a panko breaded, deep-fried pork cutlet. Like the curry rice I posted last time, tonkatsu (called donkkaseu in Korea, 돈까쓰 or 돈가스 ) is another dish that made its way into Korea by way of Japan and became widely popular. The Japanese adapted their version from the West. 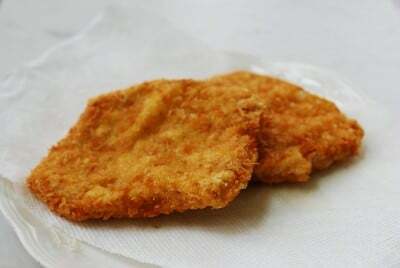 There are many versions of breaded and fried cutlets in the world. The first one comes to my mind is German schnitzel. 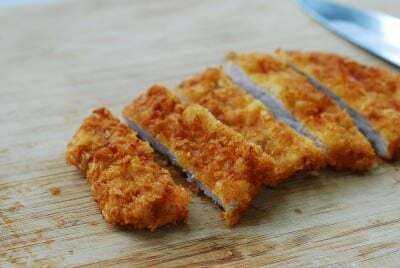 When I tried it for the first time in Germany many years ago, I actually thought it was very similar to tonkatsu, other than the fact that it used regular breadcrumb, not panko. During my recent trip, I ate at a restaurant in Luzern, Switzerland, where wienerschnitzel was actually made at the table. They breaded and pan-fried a thin, large veal cutlet in lots of butter, making the entire restaurant smell buttery delicious! Then, there’s an Italian version — Cotoletta, and milanesa in Latin America. 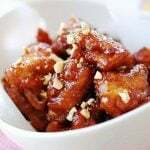 Does your country have a popular breaded and fried meat dish? Please tell us a little bit about it in the comment section. Pork loin chops are the best cut for tonkatsu. 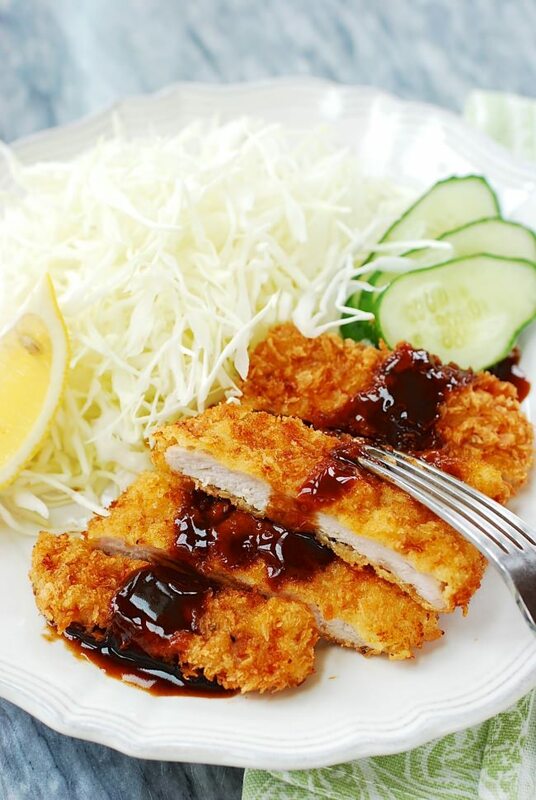 Korean markets usually sell pork cutlets specifically prepared for tonkatsu with slits all over on the meat. The slits help tenderize the meat and keep it nice and flat when fried. Koreans typically make tonkatsu thinner and larger than the Japanese version, but it’s up to you how thin you want to make. The oil should be hot enough but not too hot. 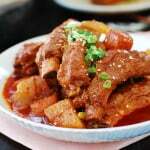 If it’s too hot, It will brown the breadcrumbs too quickly before the pork is cooked through. 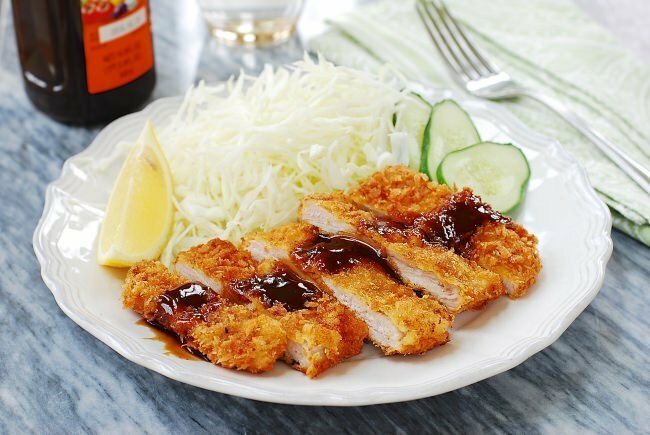 As with typical Korean deep-frying, double frying is the key to crispy tonkatsu. 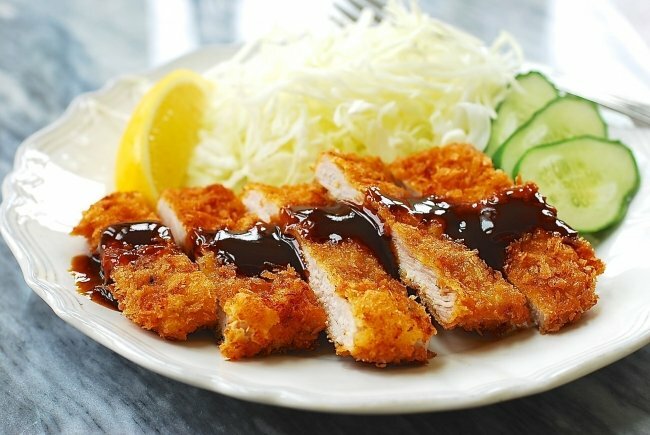 Crispy, crunchy panko breaded, deep-fried pork cutlet! 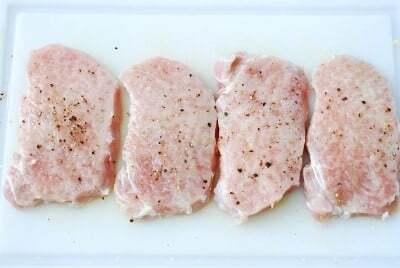 Trim off fat from the pork. Make a few slits without cutting through the meat. Then pound the meat with a meat pounder until desired thinness is achieved. 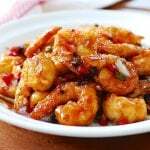 Squeeze out the juice from the grated ginger and drizzle over the meat, and lightly sprinkle with salt and pepper. 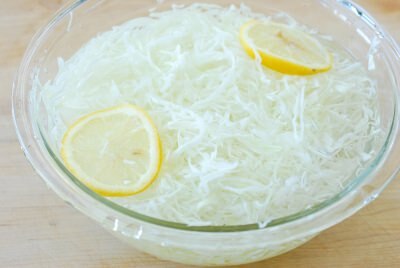 Thinly slice the cabbage leaves, and soak in cold water with a couple of slices of lemon. Drain well before serving. 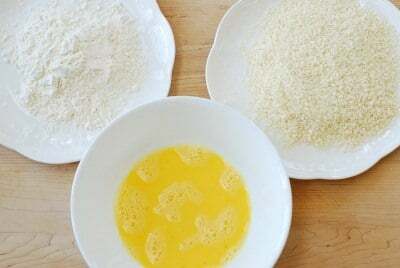 Place the flour and breadcrumbs in two separate plates, and the egg in a shallow bowl. Dredge the meat in flour, shaking off excess flour. 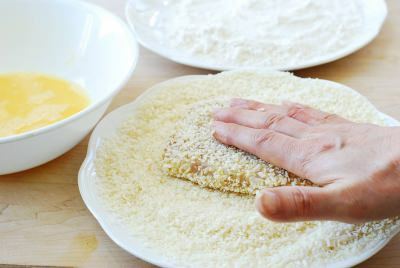 Dip in the egg, and then dredge in the breadcrumbs, pressing down gently on the meat for a good coating of breadcrumbs. Repeat for the remaining pieces. 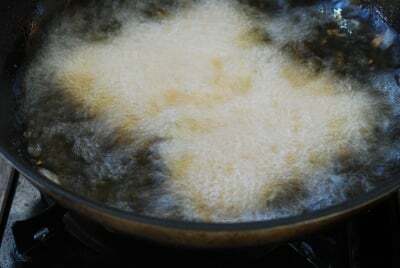 Add 4 cups of oil to a deep fryer, wok or a deep pan. Heat over high heat to 325°F. Drop the meat in the oil. Do not fry more than 2 pieces at a time. Cook until lightly golden brown, flipping once, about a minute each side. The cooking time will depend on the thickness of the meat. Remove, and drain on a wire rack or a paper towel. Reheat the oil to 325°F. Add the meat and deep fry again for a minute until lightly golden brown. Drain on a wire rack or drain on paper towel again. 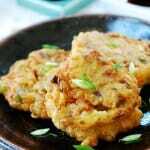 Cut each cutlet into small pieces and serve on plate with cabbage slaw with the optional lemon and cucumber slices for garnish. 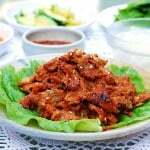 Serve hot with the katsu along with rice and kimchi, if desired. In England we have chicken nuggets or goujons haha, they’re basically the same just chicken, without panko breadcrumbs. 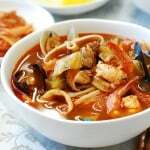 In small bowl, slowly whisk all until it becomes a homogenous consistency. Enjoy! While living in Korea one of my sons favorite dinners was “Italian Donkkaseu” – (only found in Korea I might add, & all over the Gunsan area I tell ya……). Same as what’s found here but with cheese inside!! I’ve never been able to find it outside of Korea and people seem to think I’m an idiot asking for “Italian” Korean food….